Synopsis: At fifteen, Anaii is the most important member of her tribe—and the most mysterious. Ever since Anaii can remember, the spirits of the wind have whispered of fertile hunting grounds and imminent enemy attacks. But when her people are ambushed by a brother clan without any apparent cause, the spirits remain eerily silent. While Anaii is tormented over which man she must choose, the wind whispers of a new threat that could destroy both clans. Only a union will afford a chance at survival, but the reality of that union is based on one thing—which man Anaii chooses to die. I enjoyed THE WIND WHISPERER a lot more than I expected to given that it was such a step outside my usual comfort zone, and I've never read a book in this culture before, but something about the excerpt I read just spoke to me; forbidden love, the simplistic nature of clan life, star-crossed lovers. I took a chance and it paid off. I thought I might need to use the paranormal angle as a crutch to help ease me into it, but it actually wasn't necessary. I was fascinated by the characters immediately. Now I actually think I'd like to try other books in this genre, which has to be a compliment to this author. So what's it about? 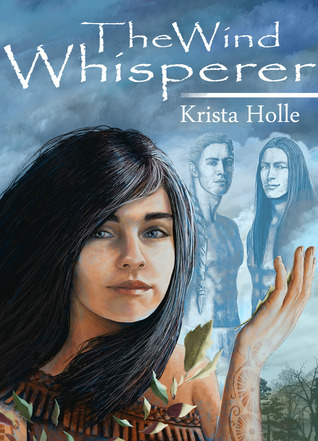 Well, the main character is Anaii and she, as well as being the chief's daughter, is a Wind Whisperer. She can hear the voices of the wind spirits and they tell her things that help her clan: if it will rain, where their enemies are, stuff like that. And they do have enemies - the Zenni, who raid one night and, if not for Anaii's warning, would have obliterated her much smaller clan. But why did they attack, after ten years of peace? Well, that what's Anaii's father wants her to find out. I enjoyed Anaii as protagonist, flaws and all. And, yes, she does have them. She's young, a little pampered, a little stubborn, and at only 15 winters (although that's considered full grown here), she's new to romantic feelings of any kind, and makes some mistakes along the way. The love triangle was... Well, you know how they go. When both boys are adoraballs it's sooooo hard to see the one she doesn't choose have his heart broken. Why can't they make one of the choices a total butthead to make it easier on us, hmm? *sigh* I'm not one of those readers who's automatically turned off at the mention of a love triangle, and in a way I enjoy the complications they stir up, but they're always, always bittersweet. I really enjoyed the Wind Whispering parts. It started off as a tool used only in small ways around the clan, but became so much more. Once the clan troubles escalated, Anaii's skills also rose the occasion and I was glad to see her develop in all ways. Her skills became invaluable. Although the story was wrapped up and the love triangle fully resolved, it seems the author plans a second instalment for these characters. I would say that at the moment, though, this book works perfectly as a standalone.